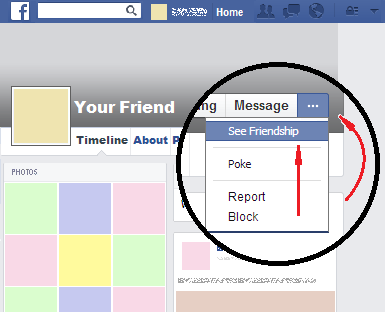 Want to see a friendship page on Facebook? This guide will show you how to do it. Once you have logged in to Facebook, go to the Timeline of the person with whom you have a friendship that you want to see. You can do this by looking for his name in the search box at the top of your page. Keep in mind that you can only see friendships between you and one of your confirmed friends. Once you are in this person’s Timeline, click on the button with the suspension points (“...”) that is located near the lower right hand corner inside his big cover picture. Then, in the appearing menu, click on the “See Friendship” option. This way you will see the page of the friendship between you and that person.